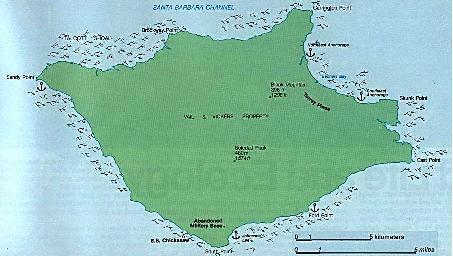 The island's earliest known human inhabitants were the descendants of the Chumash Indians who called this island Huima. Although they left no written records of their occupation, their civilization is studied by archeologists through the analysis of that which they left behind. Scientists agree man occupied this island for at least ten thousand years. An additional school of archeologists points to evidence suggesting a far greater antiquity to mans presence, in a setting perhaps contemporary with dwarf mammoths some 29,000 years ago. The first written record concerning Santa Rosa Island is found in a journal of the expedition of Juan Rodriguez Cabrillo who sailed to the coast of Southern California in 1542-1543 for the King of Spain. In the journal however, the island was called Nicalque, where three Indian villages were observed (Nichochi, Coycoy, and Estocoloco). Although Santa Rosa Island had been claimed for the Spain by Cabrillo, it was the 1793 English expedition of George Vancouver which standardized and finalized the names of the eight Southern California islands, including that of Santa Rosa. Island Chumash society was vulnerable to both diseases and economic changes introduced by European contact, and as a result, their numbers greatly diminished. In 1805, Fr. Estevan Tapis of Mission Santa Barbara proposed moving the remaining Santa Rosa Islanders from their seven occupied rancherias to a mission on neighboring Santa Cruz Island in order to "bring the Gospel to the inhabitants of the Channel Islands." The island mission was never built, and by the end of the second decade of the 19th century, the last of the island Chumash had moved to mainland missions to learn new ways of animal husbandry and agriculture.